Target has added a few lines to their Price Matching Policy that I thought I should share before you try to price match in the store. Now Target Coupons will be applied, before, the price match is applied. Manufacturer coupons will be applied after the price match is made. 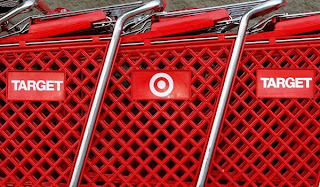 Target coupons will be applied before the price match is made. If the competitor price is still lower than the price after the Target coupon has been deducted, the ad match can be adjusted to match the competitor's price. The Target coupon will be applied before the price match is made. If the competitor price is still lower than the price after the Target coupon has been deducted, the ad match can be adjusted to match the competitor's price. Once the price match is made the manufacturer coupon will be applied. Reminder: We accept one manufacturer coupon and one Target coupon for the same item unless either coupon prohibits it. Target does not ad match a competitors coupon-required offers. To read the full Price Matching Policy, click here. Don't forget to print a copy and take it with you to the store when you price match. I am also being told that we can no longer print Target Coupons from the Baby/Gift Registries. I have not had a chance to try this yet but I will let you know what I find out. If you have tried please let us know if it worked or not. If you would like to see the previous Target coupon policy, click here. Don't miss the freebies, coupons, and discounts! Subscribe Now!